There are a lot of things to consider when picking which park to visit for each day of your trip. Here is the list of questions you should ask yourself. Will you be using a touring plan? What are the overall crowd levels for your trip? Do you have access to Extra Magic Hours? If so, do you plan to use it? Do you already have restaurant plans for a specific date? How many park days do you have in total? How many days do you want in each park? Do your park tickets include the park hopper option? Are there any special events during your visit? You can always use the park levels on the crowd calendar to compare the expected crowds at each park but let us visit these questions one by one to see how your response may affect your planning decision. The #1 way to avoid waiting in line is to use a Disney World Touring Plan. You will tour more efficiently with a touring plan at a park at level '8' then you will without a touring plan at a park at level '4'. Touring plans work, use 'em! Do so and it won't matter what day you pick. If the crowd calendar level is a '4' or lower picking which park to visit won't matter. You used the crowd calendar to choose a week with lower crowds, visit whichever park you wish, you've earned it. If the crowd calendar level is greater than '4' then it may be worth it to spend some time selecting parks to visit. If you are staying at a Disney hotel and have access to Extra Magic Hours then by all means take advantage of the perk, especially for the Extra Magic Hour in the morning. Make sure to arrive before the early hour begins however, if you miss that first hour it can really affect your touring. Once you have decided to take advantage of the Extra Magic Hours choosing your park is easy, the schedule is listed on our main calendar page. Just look for the Extra Magic Hour listed in italics next to the park hours. If you have park hopper tickets a great tip is to hop to the park that hosts the Extra Magic Hour during those hours only and visit the park with the lowest crowd level the rest of the day. This is the great "chicken vs the egg" conundrum of Disney Park planning. Is it better to get the dining reservations you want then plan your parks around dining or is it better to plan your parks first, then book your dining based on the park you will be visiting? The short answer is...it is up to you. What is more important? If you finally booked a table at a restaurant you have always wanted to try then plan your park around that. If avoiding crowds is more important then focus on the crowd levels first. Either way, remember rule #1! Personally, we here at Touringplans find it more difficult to plan out the restaurants than to plan out the parks to visit. We usually start by reserving the restaurants first, then worry about which park to visit. You will have to decide what makes most sense to you and your group. So, we use a touring plan, have no restaurant reservations, there are no Extra Magic Hours, and the crowd levels are above '4'. Now what? The good news is, the hard part is over. Just take a glance at the park levels on the crowd calendar for your travel dates. The lower the number the better. To see which park is the best choice for any given day, look for the lowest number on the row. To see what is the best day to visit a particular park over several days, look vertically at the column for that park. Here is an example of the Crowd Calendar page for a few weeks in October. Suppose we wanted to choose which park to visit on October 9. We see that the park crowd levels are: Magic Kingdom '2', Epcot '4', Disney's Hollywood Studios '1' and Animal Kingdom '2'. So, all else being equal, the Studios looks like the best choice. Now suppose we want to see what day is best to visit Epcot between October 3 and October 7. Epcot crowds for those days are labelled: October 3 - '1', October 4 - '5', October 5 - '5', October 6 - '5', October 7 - '1'. So, all else being equal, our best day for Epcot looks to be either October 3 or October 7. As a rule, we don't recommend visiting a park hosting special events. While the wait times can be low, there may be an influx of people that will cause bottlenecks around the park. A good example is the Food & Wine Festival at Epcot. Guests flock to World Showcase to try the food kiosks, but don't take in the attractions. Weekends during Food & Wine can be some of the busiest in the fall, but the wait times will be relatively low. One exception to this rule is when the Magic Kingdom closes early for a "hard ticket event," such as Mickey's Not-So-Scary Halloween Party and Mickey's Very Merry Christmas Party. We've measured that the wait times during these days are some of the lowest of the year. Even though there are fewer park hours for touring, it is difficult to pass up the low wait times during the day. Be sure to compare the Per-Park Crowd Levels and the wait time forecasts for that day to make the best decision possible (see this blog post for more info). Reverse Psychology - Should I avoid the park with the lowest crowd level because everyone will go there? "If everyone sees that Animal Kingdom has the lowest crowd level," you ask, "won't that quickly become the most crowded park?" Unfortunately, no. While we would love to dictate the ebbs and flows of crowds at Walt Disney World, we just ain't that big (yet). We estimate that a small percentage of people in any park have seen our Crowd Calendar, so consider yourself one of the lucky ones. We monitor wait times every day at every park, so if we do start to influence crowds, we'll be the first to notice. Shouldn't Magic Kingdom always be more crowded than Epcot, Epcot more crowded than the Studios, etc? Our reader surveys tell us that people judge the size of the crowds not by how many people are in the park but by how long they have to wait in line. 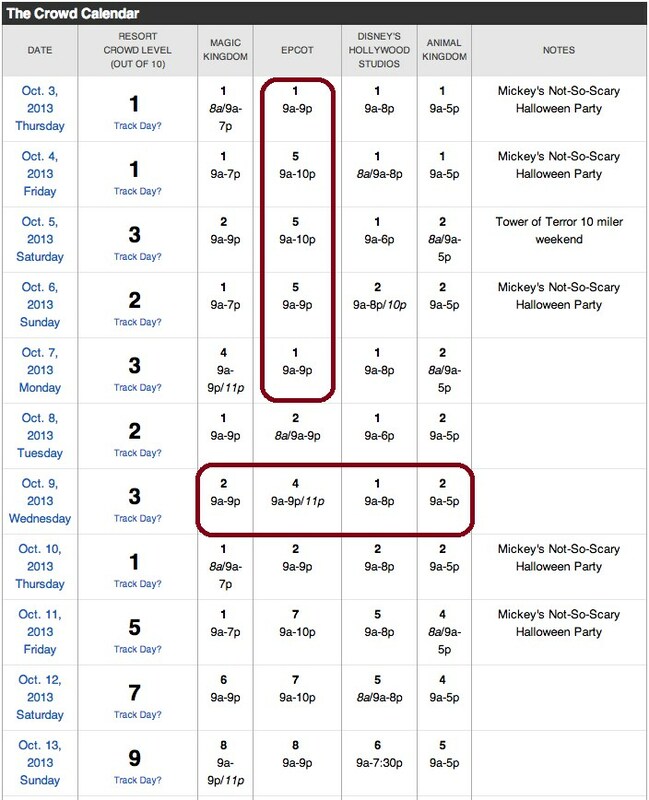 For this reason we base our crowd calendar on wait time data in each park, and compare it to other days at the same park. Thus, we could say that a below average day at the Magic Kingdom with 30,000 people is less crowded than an above average day at Epcot with 25,000 people. The Magic Kingdom is able to handle many more guests than the smaller parks. Check out our Frequently Asked Questions page for the Crowd Calendar. What is the last word of the title The Best of the _______?